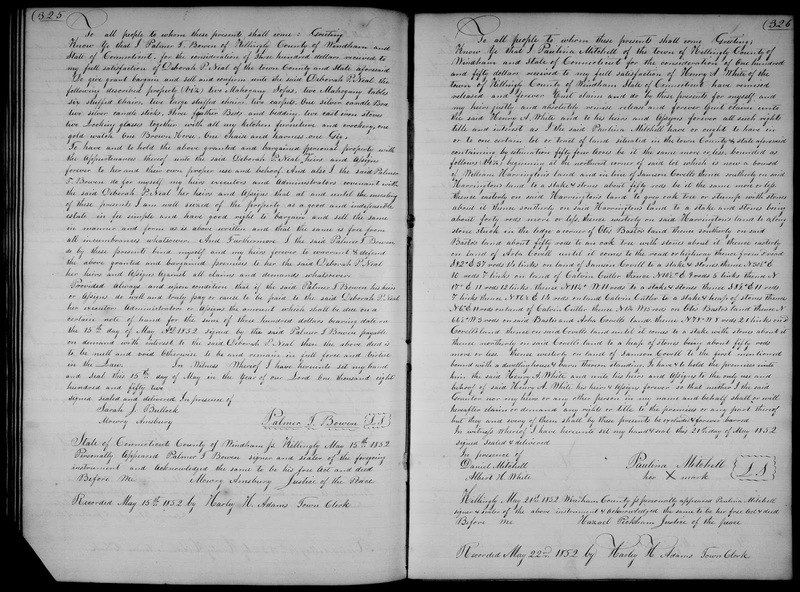 Genea-Musings: Amanuensis Monday - Post #432: 1852 Deed of Paulina Mitchell to Henry A. 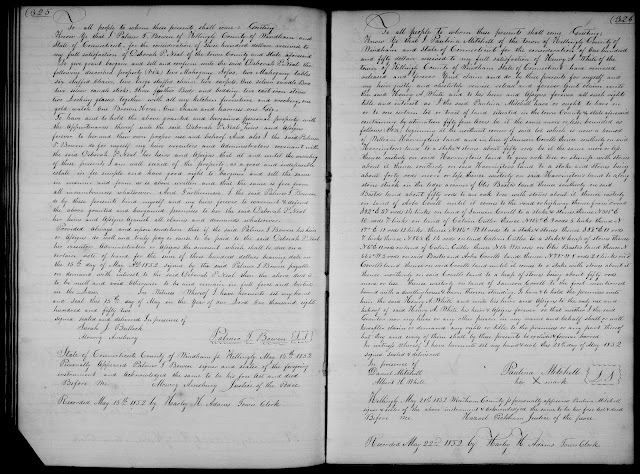 White in Killingly, Conn.
Amanuensis Monday - Post #432: 1852 Deed of Paulina Mitchell to Henry A. White in Killingly, Conn.
but they and every of them shall by these presents be excluded & forever barred. In witness Whereof I have hereunto set my hand & seal this 21^st day of May 1852. Killingly (Connecticut) Town Clerk, Land Records, 1709-1907; General Index, 1709-1908, "Land records, Vol. 37-39, 1850-1857," Volume 37, page 326, Paulina Mitchell to Henry A. White, 21 May 1852, recorded 22 May 1852; accessed on Family History Library microfilm US/CAN 1450885; original records in Danielson, Conn. town hall. There are several deeds for my 2nd great-grandfather Henry A. White (1824-1885) in Killingly, Connecticut land records. These records are recorded in the Connecticut towns rather than in the county records. The metes and bounds for this deed define the boundaries of the property, and provide some indication of the neighbors. Hopefully, I can find a map of the property owners in this time frame to try to figure out just where the land was in Killingly. Henry A. White (1824-1885) was a son of Jonathan and Miranda (Wade) White of Killingly. He married Amy Frances Oatley (1826-1864) in 1844 in Thompson, Connecticut. Their daughter, Julia E. White (1848-1913), who married Thomas Richmond (1848-1917) is my great-grandmother.